Cliffside Carvings in the Ming dynasty are located on the north cliff of Doushuai Rock on the east peak, 100 meters away from Pagoda of Hongjue Temple. There are five Buddhist niches on the cliff, three on the north cliff and two on the east cliff, and altogether 133 statues. The three sides of the carvings, which are shaped like the Chinese character “Ji”，are 11.5 meters long from south to north and 5.8 to 8 meters wide from east to west. In the middle is the ground of 77 m2. 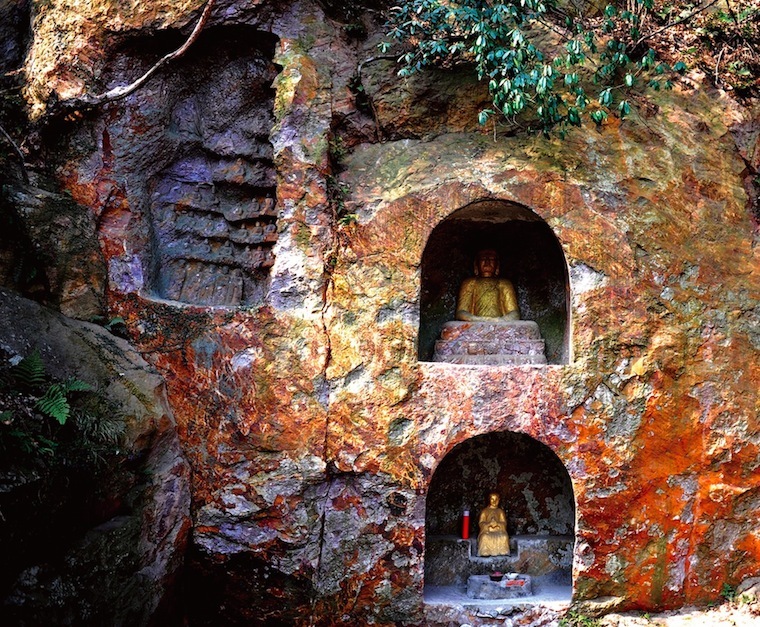 In the five Buddhist niches on the cliff, the number of Buddha statues are different. In the central niche, there is only a sitting Statue of Sakyamuni. The height of the statue is 1.78 m. Sakyamuni performs Dhyana-Mudra, with the right hand on top of the left and thumb tips pressing against each other. The base is sumeru shaped lotus seat. On two side walls of the niche is carved characters, meaning “these belongs to Hongjue Temple”. 3 meters away from the central niche in the east and west, there is a niche respectively. The east one has 9 floors with 75 statues. At the bottom floor are monks, and the rest are all friars. However, most have been destroyed. The west niche is carved on the wall in the shape of Chinese character “ji” and is similar to east niche in content and style. 0.39 m below the west niche, there is another niche with a 0.45m high Maitreya statue, which is superior to other statues in artistic effect. Carved on the right side are “Bhiksu sculptured the Amitabha Buddha Statue and offered it forever, May fifth of the First year of the reign of Emperor Chenghua in the Ming dynasty”. On both sides of the niche, four sections of Sanskrit are carved. Six-word Sanskrit mantra “ong ma ni ba mi hong” is carved on the wall of the east cliff, 1.6m long. There is a poem “Inscription beside Ganying Spring” in running script, 0.5m long and 0.32 m wide. There are 78 Chinese characters in all.